Tenants tend the Crossings’ garden that is irrigated with rainfall collected from the building’s roof. Image courtesy of Virginia Supportive Housing. 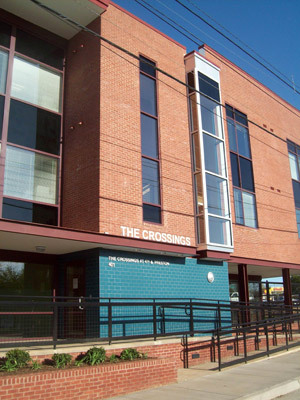 In March 2012, the city of Charlottesville, Virginia saw the completion of its first permanent supportive housing complex, The Crossings at Fourth and Preston. The 60-unit building provides housing for people experiencing homelessness and those earning less than 50 percent of the area median income. The development has adopted the Housing First model, in which people experiencing homelessness are provided with a stable place to stay before being connected to employment and health services. The Housing First model uses housing as a platform to attack the root causes of homelessness and ensure that formerly homeless individuals become and remain stably housed. The Charlottesville region had 250 individuals experiencing homelessness in 2012 according to The Haven (formerly the Thomas Jefferson Area Coalition for the Homeless), which conducts the annual Point-in-Time count. The survey indicated that the primary driver of homelessness in the area was employment related; almost three out of four individuals experiencing homelessness were looking for a job or a better job and two out of three were not working. Many reported having difficulty finding or keeping a job because they lacked adequate and reliable transportation, had medical issues that made it difficult to hold a job, or had a criminal record that precluded them from securing stable employment. Charlottesville’s civic and nonprofit leaders have embraced Housing First as a strategy to end homelessness. The model, developed in New York City by Pathways to Housing, assumes that access to stable housing helps formerly homeless residents more effectively address the reasons for their homelessness, including mental illness and substance-related disorders. As with other Housing First developments, individuals are placed in permanent housing at The Crossings with none of the restrictions or requirements found in housing-ready programs, which typically require sobriety or enrollment in a treatment program. Virginia Supportive Housing (VSH), the nonprofit that developed The Crossings and 650 other units of permanent housing in the Richmond and Hampton Roads metropolitan areas, believes that housing should be a prerequisite to services rather than the other way around. With this Housing First policy, VSH has successfully moved 98 percent of its residents from homelessness to stable housing and helped 96 percent obtain a stable income. The Crossings offers 60 fully furnished studio apartments, which are split evenly between individuals experiencing homelessness and low-income individuals to avoid concentrating formerly homeless individuals at a single site. All tenants at The Crossings, regardless of their former housing status, are held to the same lease terms and granted the same access to the building’s amenities — an on-site fitness center, a computer room, laundry facilities, an outdoor terrace, and a lounge. The building includes a number of green elements to reduce its environmental impact and operating costs. The apartments have ENERGY STAR® appliances and windows with low-emissivity coatings that are better insulated and transmit more natural light than standard windows. Barrels collect rainwater to irrigate landscaped areas, reducing the building’s water consumption, and the parking lot is paved with a permeable surface that passes stormwater through to the soil. The building’s active and passive solar energy elements include solar panels, which generate 20 percent of the building’s overall electricity needs, and solar thermal water heaters, which provide hot water to individual apartments and common areas such as the laundry room and restrooms. These sustainable features helped The Crossings win both the 2012 Virginia Housing Award for Best Affordable Housing Energy Conservation Effort and the 2013 EarthCraft Virginia Multifamily New Construction Project of the Year award. The Crossings embraces the “housing first” model to combat chronic homelessness in Charlottesville. Image courtesy of Virginia Supportive Housing. The cost of the development was slightly more than $7 million, with most of the funding coming from $4.25 million in low-income housing tax credits. The other major sources of funding were loans from the Virginia Housing Development Authority ($900,000), the Virginia Department of Housing and Community Development ($700,000), and the Federal Home Loan Bank of Atlanta ($600,000). The remaining $600,000 came from the Thomas Jefferson Planning District Commission and local foundations. Housing vouchers for the 30 units set aside for individuals experiencing homelessness are provided by the city of Charlottesville (21) and Albemarle County (9). At The Crossings, VSH focuses on the most medically vulnerable, chronically homeless individuals; many residents have lived on the streets for an extended period because of mental illness, disability, or substance abuse. This population typically places a huge burden on city services such as emergency rooms and jails, which are forced to address the effects of homelessness but are not equipped to treat its root causes. According to Dave Norris, the former mayor of Charlottesville and an early supporter of the project, “When you add the cost of circulating people in and out of shelters, out of jails, out of mental health facilities, out of treatment centers, out of courts. . . it costs a lot of money to keep people homeless”. To prevent a return to homelessness, VSH offers voluntary, onsite counseling and support with an emphasis on housing retention. Six staff members work on the premises, including two case managers. The case managers act as a resource for residents, helping them avoid eviction, keep medical appointments, and understand treatment recommendations, according to Kristin Yavorsky, VSH supportive services director for Central Virginia. 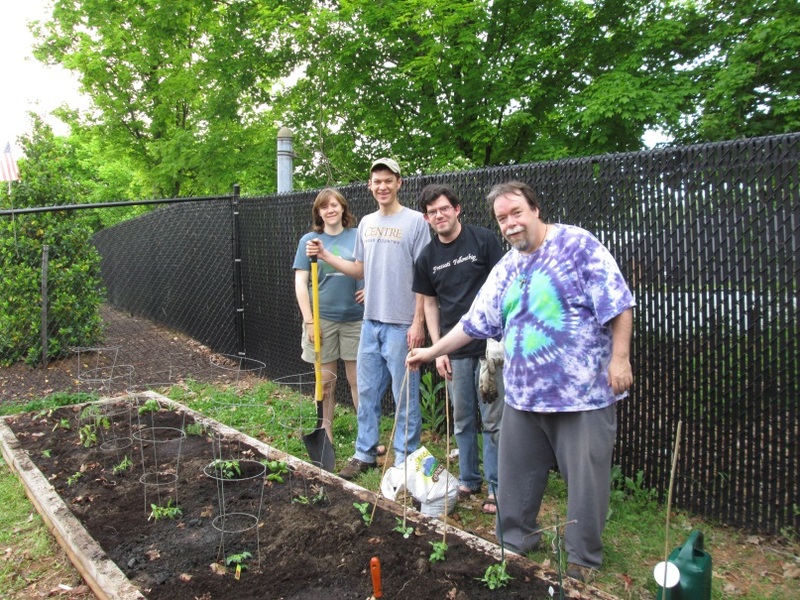 Instead of providing a full range of support services directly, the staff helps residents take advantage of local services offered near the building’s resource-rich location between the University of Virginia and downtown Charlottesville. Physical and mental health clinics, the university’s hospital, a substance abuse treatment center, and the Charlottesville Department of Social Services are located within a mile of the building. Combining in-house counseling with local services allows residents to choose as much or as little programming as they need and does not force them to move if their needs change. The results at The Crossings demonstrate the strength of the Housing First model. In its first year of operation, the development successfully housed 68 individuals, 40 of whom were previously living on the street. Ninety percent of the formerly homeless individuals have not returned to homelessness, and individual incomes have risen by an average of 47 percent. With the success of The Crossings, civic and government leaders are now considering a permanent supportive housing development for families experiencing homelessness. Although families require a different set of housing requirements than do individuals, the basic commitment to Housing First that defines The Crossings would continue. Interview with Kristin Yavorsky, 20 June 2014. Interview with Dave Norris, 11 June 2014.